Eisenhower Dollar value is not dependent on key dates since there’s no key dates to be found in this series. Some people find the dual date 1776-1976 Bicentennial Ikes and think they’re rare, but such is not the case. You have to look into the varieties and condition grades to find the higher values, so most Eisenhower Dollars are worth $1, if you find them in a mint or proof set then they will be worth a few dollars. 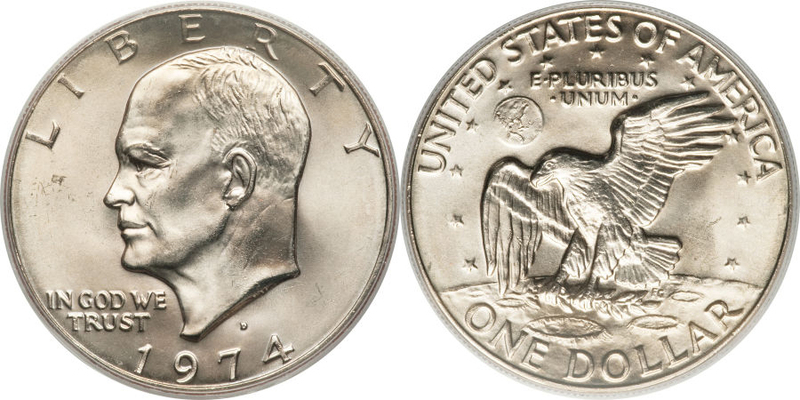 Furthermore Eisenhower Dollars look silver but most are not, and when they are silver they’re clad in 40% silver. The 40% clad Ikes are found in blue envelopes, sealed in cello, and in brown boxes, housed in GSA type holders, and some were issued in Bicentennial sets with a quarter and a half dollar – all have “S” mint marks and each weigh 24.6 grams. 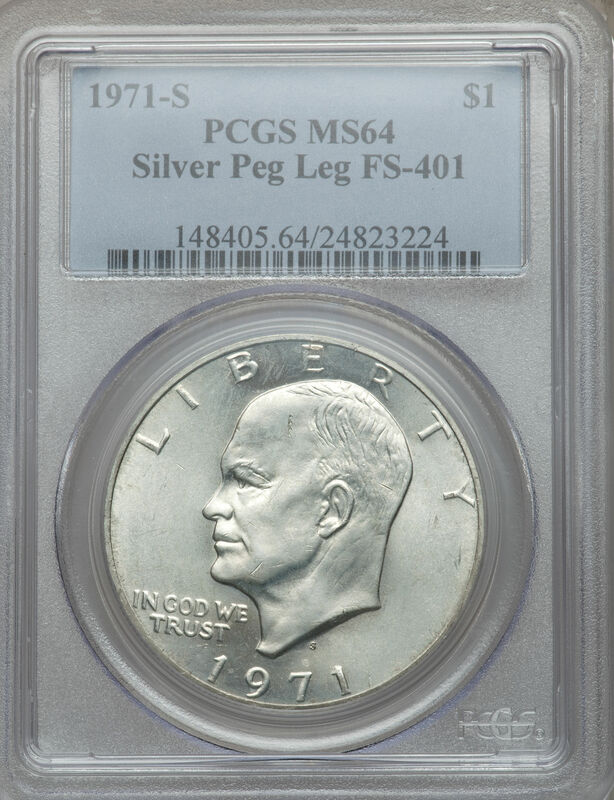 Since Eisenhower Dollars are found abundantly in MS64 (Mint State) and lesser grades then the value is going to be low for these grades. The coins are large and that translates into more surface exposure to contact marks from other coins, even during the minting process, so they are worth only a few dollars or less when they’re MS64 and less. Raw coins rarely sell for more than $5 (most sell for $2 or less) so having them graded by a third party grading service will help the resell value. However, if the coin does not grade at least MS65 then the submission fees far out-weight the value of the coin. You want to send Eisenhower Dollars that have the best chance at MS65 or better because their value can be upward of $150 for some dates and mints, but there’s some that need to come back MS66. In example, the 1974-D in MS65 is worth around $15 but in MS66 it’s value jumps to $120, so you wouldn’t want to send a 1974-D to be graded unless you’re certain it will be graded greater than MS65. If you want value in your Eisenhower Dollars then you want to find and collect the varieties; but remember that even with varieties you want the mint state examples. The 1971-S you want to look for what’s called the “Peg Leg” (a small tails extends off the R in LIBERTY) and those can sell for $50 in MS64. In 1972 you want look for the Type 2 Earth and the Type 3, but the Type 2 is the most valuable variety and can be worth over $1,000 in MS65. In 1776-1976 Bicentennial year look for the Thin Letter Reverse without a mint mark (Philadelphia) and this can be worth a few bucks in MS64 and up. Also look for the 1971-D Tiger Claw and Happy Eagle and check all your 1974-D Ikes to see if they’re silver (not supposed to be). Mint mark: None (for Philadelphia, PA) between Eisenhower’s head and the date. Eisenhower Dollar Value is determined by the rarity of the date, if it's a variety, the silver content and most of all, their grade. Ike Dollar worth, value.